In a desperate need for mindless entertainment, Tron Legacy sounded like it would fit the bill. I had seen Tron many years ago, but most of it was forgotten, but I was accompanied by a friend who had recently seen it, so brought me up to scratch. 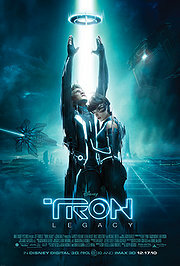 Basically, son of man who created Tron is sucked into the digital world of the grid, after trying to find his missing father, and has to fight for his life. With help, he finds his father, stuck in the world for the last 25 years, and they try to escape back to the real world. That’s the bit I understood. It’s shiny and whizzy with the special effects. White – good, orange – bad (so it’s easy to spot the villains). Plus the score is by Daft Punk, so that bit is excellent. However, people appear, then disappear without returning so you have no idea what is going on. There are huge gaps in the storyline, inadequate characterisation and missing chunks of dialogue as far as I could tell. Did someone come in and slice scenes out? Should we expect a director’s cut? We came out of the cinema in hysterics trying to make head or tail of it – and this is from two sci-fi fans. Is it so bad, it’s good? No, it’s just a very poor movie. Next time guys, try coming up with more than just a basic idea. This entry was posted in YearInFilm and tagged 2010s, 4/10, action, odeon, sci-fi, usa. Bookmark the permalink.